I recently went through my collection of photos from 2008 trip to Amsterdam, reminding myself that I need to find the next and earliest opportunity to return. I sorted through dozens of pictures of bikes. Bikes at cafes. Bikes on bridges. Bikes parked by the hundreds at the rail station. People on bikes. Kids on bikes. Old people on bikes. Everywhere bikes. I have so many to choose from, and that’s on top of the pictures of Amsterdam’s wonderful canals and buildings. But one of my favorite pictures is this one. There’s no bike in it, but it’s all about the bike, to be sure. 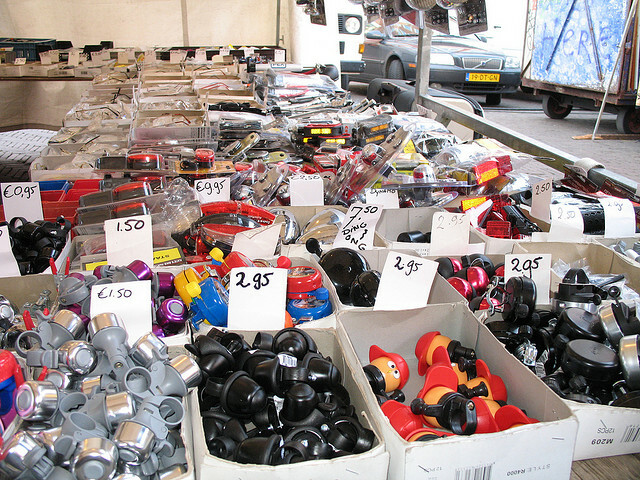 It’s from Amsterdam’s Nieuwmarkt and, in case it’s not clear in the picture, is from a large stall at the market that sold bike supplies, from lights and bells to tires and pedals. I bought a bell there which I affixed to my commuter bike when I returned to my job in Boston. You’ll know New York has come a long way in terms of its biking culture when supplies such as these are available at the street fairs that tend to shut down random avenues each summer. Instead of grilled corn, ten-packs of socks, and huge bottles of spices, perhaps we’ll see some industrious person set up a stall such as this in the near future.